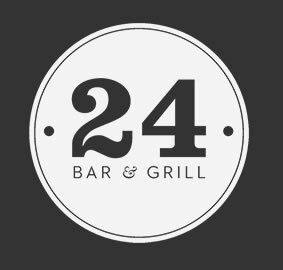 24 Bar & Grill is named rather unoriginally after it’s address, 24 Princess Street, Manchester. It occupies the basement of the Arora Hotel which was previously home to the fine-dining restaurant ‘Obsidian‘ which I visited in late 2009. After walking down the stairs I remembered more and more of the Obsidian visit, the familiar bar hasn’t changed too much but the decor in the dining room is much more friendly, lighter and vibrant than before. Coincidently we were also seated at the exact same table we sat at previously. That was the last of the similarities as once we were presented with the menus we realised how different the restaurants were and all thoughts of Obsidian were immediately forgotten. The menu is small but interesting and as the name suggests is dominated by grilled meats, steaks & burgers with a couple of nice seafood dishes. Although i’m generally a fan of limited menus I was slightly disappointed that only 3 steaks are available: 12oz Rump, 10oz Sirloin and 7oz Fillet. I can understand not wanting to overwhelm the customer with too much choice but a little more variety hear would have been appreciated both in additional sizes and particularly that my favourite cut RibEye isn’t available at all. The menu is also complimented by a specials board which contained a number of additional fish dishes. We ordered the house breads first which arrived quickly, were warm and incredibly fresh. They were accompanied with both salted butter and balsamic & oil. It’s rare to receive both butter and oils but it was a welcome treat. All 3 breads were unique in their looks, shape, taste & texture but all 3 were delicious. Our starters arrived shortly afterwards, Peppered Beef Carpaccio with capers, cornichons, shallots, rocket & horseradish creme fraiche for myself and smokey meatballs in tomato sauce for my partner. 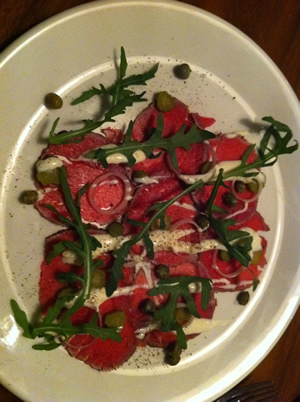 The beef carpaccio was a delight, the wafer thin pieces of raw beef had been sliced to perfection. The remaining ingredients were very cleverly balanced, considering how strong the flavours of capers, rocket & horseradish can be. The dish was so light and a joy to eat. My partner enjoyed the meatballs but thought the tomato sauce lacked depth, I disagreed, yes it was simple but it was a good tomato sauce which let the meatballs speak for themselves. However I only had a small taste so perhaps my opinion would have been different had I eaten the entire bowl. Our main course was quite slow in coming out given how fast the bread and starters had arrived. I ordered the 10oz sirloin with triple cooked chips, blushed beef tomato & watercress, the seasonal greens and a bone marrow gravy. 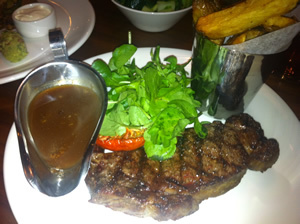 First impressions were great, the steak was a lovely colour and had a great criss cross chargrilled into it. The plate was very clean with the sauce in a gravy boat and the chips in a metal cup. It tasted every bit as good as it looked, the steak was ordered medium rare and was perfectly cooked, the tomato had been rubbed with garlic which is such a nice touch, simple but incredibly effective. The triple cooked chips were excellent, incredibly crispy on the outside yet light and fluffy on the inside, seasoned perfectly and the potato skins left on for extra flavour and texture. The star of the show however was the bone marrow gravy, i’m a huge fan of meaty sauces and it didn’t disappoint, perfectly smooth, just the right consistency and such big deep meaty flavours. The only disappointment was the bowl of seasonal greens which was in fact a bowl of garden peas, broccoli, courgette & pak choi. They may all be ‘seasonal’ (although i’m not an expert i’m dubious about the courgette at least) but they felt like a very random selection and I really didn’t need all 4 together. Worse than that though is that they were all slightly overcooked and under seasoned. It wasn’t enough to take away from the rest of the dish but a shame nevertheless. My partner ordered the Cajun blackened pork chop with sweet potato & herb rosti, lime guacamole and sour cream with a side order of home-made ‘winter’ slaw. The pork chop was tasty and cooked well but it could have done with the outer ring of fat either removing or being rendered down more during the cooking process, the sweet potato rosti was delicious as was the guacamole but we would have liked more of it. The winter slaw was good but we both wondered what was ‘winter’ about it, we expected a twist on a traditional coleslaw, perhaps using a root vegetable such as celeriac but what we got seemed to be a regular coleslaw. We didn’t order desserts, only because we couldn’t manage them after a heavy meal (particularly the steak, chips & gravy). Much like the rest of the menu the desserts were limited but very interesting, I considered both the Chocolate & Chilli Brownie and the Vanilla Rice Pudding Brulee with home made jam. I decide against it but I have no doubts I would have enjoyed them. As well as great food and service 24 Bar & Grill serves a great range of cocktails. The cocktail menu is as interesting as the food menu, we ordered and enjoyed a Basil & Kiwi Mojito, Strawberry & Black Pepper Daiquiri, Honey & Basil Martini and a Poppy Seed Caipirinha. All of which were great, particularly the Caipirinha. My only real problem on the night was finding a good lager to drink with my steak. The wine list is fine (my partner ordered one of the house whites which was good), the cocktails list is extensive and interesting and they offer a range of craft beers but nothing simple in either bottle or draft. I would have loved a bottle of Peroni or a pint of Peroni or 1664 draft. Instead I ordered a bottle of ‘Brooklyn Lager’ which I had never tried before, it was interesting and actually worked very well with the meaty steak and rich sauce but I would consider it more of a beer than a lager. It’s darker, flatter and creamier and not what I was really looking for. Overall, our experience was hugely positive. The food was mostly excellent, the service good and the cocktails fantastic. I would definitely recommend 24 Bar & Grill for good quality informal dining, even without rib-eye steak and a good lager. The final point worth mentioning is that we visited fairly early on a weekday, 6:30pm on a Wednesday so the restaurant was quiet. Although common sense would suggest that the quieter the restaurant the better the service should be it is often not the case and it’s sometimes easy to be neglected as staff levels are lower but thankfully that wasn’t the case at 24.